The bandshell is located in Veterans Park, formerly known as City Park, adjacent to Rice Lake. The first bandshell was a wood frame gazebo style and built in 1901. In 1959 it was demolished because of its deterioration. It was in 1985, only after a reminder of the first bandshell's history, that the "Music in the Park" idea was formed by a committee of members from the Rice Lake Area Chamber of Commerce and other local musical people. Local musicians, ages 13 to 73, founded the "Municipal Brass Band" and performed during those summer months at the park. At that time, committee members had to set up chairs borrowed weekly from the UW campus for each of the eight concerts that summer. But the setting up-and-down task grew tiresome, and what with attendances reaching great numbers of 400 to 2,000, it was determined a new bandshell was the solution - one where not only performances could be held, but where storage and restrooms were incorporated. An architect, Gary J. Kucko, AIA, and engineer Robert A. Sexton, PE, were selected; plans were approved by the city and construction began in September 1986. The design of the curved roof of the band shell is unique and opens in the back framing a view of Rice Lake. The opening was designed as such as an accommodation to neighbors who loved the lake view and did not want it obstructed. The concrete stage is set at ground level. The Rice Lake Area Chamber of Commerce was instrumental in bringing it to fruition under its "Music in the Park Project" by fund raising the $60,000 needed. Many businesses, industries, and service organizations pledged to this. Also bricks and planters were sold along with a trivia game (which was based on facts about the community) which was created and sold. Dedication was June 18, 1987, with the Chamber gifting it to the city. Article from "Rice Lake Chronotype", date unknown, but most likely in 1986. ​Concerts, with programming arranged by the Chamber, are held Tuesday evenings during the summer. The City Parks and Recreation provided $2,000 for several years. With donations from the "Friends of Music in the Park" and service clubs, the concert series has continued. In 2018 a new additional concert series, "Sundown at the Shell", will debut once a month on Friday evenings. Audiences are encouraged to bring their lawn chairs, blankets and picnic baskets. City Park was the first park to be established in Rice Lake in 1901 with the donation of the land with the understanding that the park be developed within three years. The City's website describes how this deadline was almost missed, but the resourceful Park Association managed to raise the necessary funds. A fountain graces the entrance to the park. 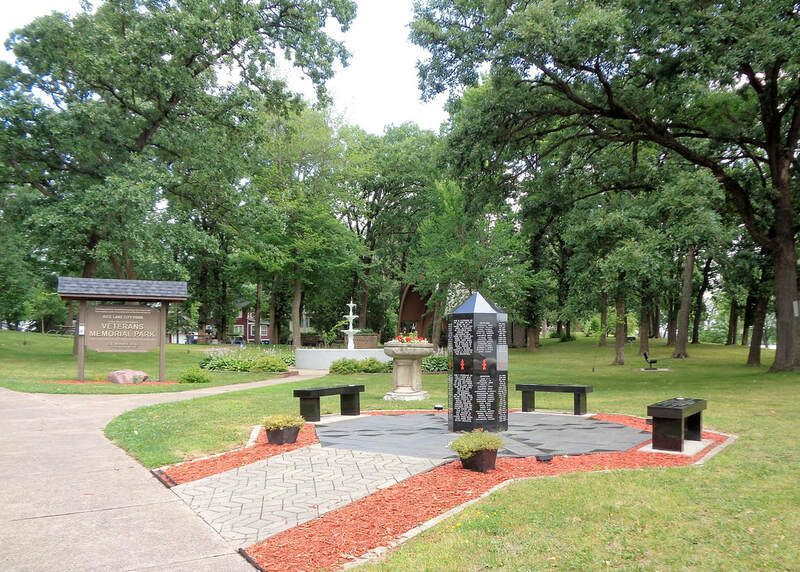 In 2012, the name was changed to Veterans Memorial Park. Impressive larger than life size statues of military soldiers surround the black granite benches with names and photos that honor Rice Lake citizens who have served the US in its wars.